Macrophages respond to infection with pathogenic Yersinia species by activating MAPK- and NF-κB-signaling pathways. To counteract this response, Yersiniae secrete a protease (Yersinia outer protein J (YopJ)) that is delivered into macrophages, deactivates MAPK- and NF-κB-signaling pathways, and induces apoptosis. NF-κB promotes cell survival by up-regulating expression of several apoptosis inhibitor genes. Previous studies show that deactivation of the NF-κB pathway by YopJ is important for Yersinia-induced apoptosis. To determine whether deactivation of the NF-κB pathway is sufficient for Yersinia-induced apoptosis, two inhibitors of the NF-κB pathway, IκBα superrepressor or A20, were expressed in macrophages. Macrophages expressing these proteins were infected with Yersinia pseudotuberculosis strains that secrete functionally active or inactive forms of YopJ. Apoptosis levels were substantially higher (5- to 10-fold) when active YopJ was delivered into macrophages expressing IκBα superrepressor or A20, suggesting that deactivation of the NF-κB pathway is not sufficient for rapid Yersinia-induced apoptosis. When macrophages expressing A20 were treated with specific inhibitors of MAPKs, similar levels of apoptosis (within ∼2-fold) were observed when active or inactive YopJ were delivered during infection. These results suggest that MAPK and NF-κB pathways function together to up-regulate apoptosis inhibitor gene expression in macrophages in response to Yersinia infection and that YopJ deactivates both pathways to promote rapid apoptosis. In addition, treating macrophages with a proteasome inhibitor results in higher levels of infection-induced apoptosis than can be achieved by blocking NF-κB function alone, suggesting that proapoptotic proteins are stabilized when proteasome function is blocked in macrophages. Yersinia pestis, Yersinia pseudotuberculosis, and Yersinia enterocolitica are the three Yersinia strains pathogenic to humans. These bacteria share a ∼70-kb plasmid, which is required for virulence. This plasmid encodes a type III secretion system and a set of secreted effector proteins that antagonize phagocytosis and cytokine production in macrophages (1). One of the effector proteins, known as Yersinia outer protein (Yop)J3 in Y. pestis and Y. pseudotuberculosis and YopP in Y. enterocolitica, is required by all three pathogenic Yersinia species to provoke apoptosis of macrophages (Refs.2 and 3 ; Y. Zhang and J. B. Bliska, unpublished data). YopJ shares sequence similarity with a family of avirulence proteins found in bacterial pathogens of plants or animals (4). The YopJ-related avirulence proteins secreted by plant pathogens are responsible for inducing the hypersensitive response, an apoptosis-like process in plant cells. At the molecular level, YopJ is required for Yersinia to deactivate multiple MAPK pathways (5, 6, 7) and the transcription factor NF-κB pathway (8, 9). During infection of macrophages by Yersinia, TLR4 plays an important role in activating MAPK and NF-κB pathways and in triggering the apoptotic response (10, 11). Macrophages use TLR4 to sense LPS, the major cell wall component of all Gram-negative bacteria. Macrophages deficient in TLR4 function are more resistant to Yersinia-induced apoptosis than their wild-type (WT) counterparts (10, 11). TLR4 uses the TIR domain-containing adaptor inducing IFN-β adaptor to activate downstream apoptotic pathways (12, 13), whereas activation of NF-κB and MAPK pathways by TLR4 involves other adaptors (reviewed in Ref.14). Under resting conditions, IκBα sequesters NF-κB in the cytoplasm. In macrophages treated with LPS or infected with bacteria, IκBα is phosphorylated by IκB kinase β (IKKβ) and subsequently is polyubiquitinated and degraded by the proteasome. This frees NF-κB to translocate to the nucleus to promote transcription of target genes, including IκBα (15). LPS stimulation or bacterial infection of macrophages also leads to phosphorylation and activation of MAPKs, including ERK, JNK, and p38, by the respective MAPK kinases (MKKs) (5, 6). The mechanism by which YopJ deactivates signaling pathways involving multiple MAPKs and NF-κB is under intensive study. It was found that YopJ interacts with multiple members of the MKK family, as well as IKKβ (16). YopJ prevents activation of MKK and IKKβ when expressed ectopically in mammalian cells (16). Sequence analysis predicts structural similarity between YopJ and a class of cysteine proteases that act on ubiquitin-like (Ubl) proteins (17). Indeed, YopJ contains a conserved catalytic triad of His, Glu, and Cys residues that are found in other members of this protease family, such as the yeast Ubl-specific protease 1 and adenovirus-2 protease. Mutations that disrupt the predicted catalytic site of YopJ abolish its ability to inhibit signaling and to trigger apoptosis (17). Orth et al. (17) have proposed that YopJ cleaves a ubiquitin or a Ubl modification from a target protein. Modification of this target protein by ubiquitin is required presumably for activation of MKKs and IKKβ (17). Several lines of evidence support the concept that inhibition of NF-κB by YopJ is necessary for Yersinia-induced apoptosis. First, it was found that activation of NF-κB before infection by overexpression of p65 or IKKβ renders macrophages resistant to Yersinia-provoked cell death (11, 18). Second, macrophages expressing an inhibitor of NF-κB, IκBα superrepressor (IκBα SR), undergo apoptosis following LPS treatment (18). Lastly, pretreatment of macrophages with the proteasome inhibitor MG-132 stimulates macrophages to undergo apoptosis in response to Yersinia infection or LPS treatment (8). In the presence of MG-132, activation of NF-κB is blocked because polyubiquitinated IκBα is stabilized. These results are consistent with the idea that some NF-κB target genes have to be expressed to promote macrophage survival (19, 20). In this study, we investigated whether inhibition of NF-κB is sufficient to induce macrophage apoptosis during Yersinia infection. Our results suggest that MAPK pathways promote survival independently of the NF-κB pathway in macrophages infected with Yersinia. As a consequence, deactivation of both MAPK and NF-κB pathways by YopJ is important for rapid Yersinia-induced apoptosis in macrophages. The serogroup I Y. pseudotuberculosis strain IP2790 (21) was used in this study. Standard allelic recombination techniques were used to introduce a selectable marker and the yopJC172A mutation into the virulence plasmid. A kanamycin (Km) cassette was inserted into the nonessential yadA gene to create a selectable marker. Briefly, the yadA gene was PCR amplified with primers F1 (5′-CCCGGGTTTGTAGTGGGCTGACTCCGAC-3′) and B1 (5′-GGCTGAACTGGCTAAACCTTTG-3′). The PCR product was inserted into the EcoRV site in pET-Blue2 using a Perfectly Blunt kit (Novagen). A SphI site was generated within the coding region of yadA using Quickchange Mutagenesis (Stratagene) and primers F2 (5′-CACAAGGTCCAGAAAAAAAAGAGCATGCATTAGCAGAAGCAATAC-3′) and B2 (5′-GTATTGCTTCTGCTAATGCATGCTCTTTTTTTTCTGGACCTTGTG-3′). A Km cassette derived from plasmid pBSL86 (22) was inserted into the SphI site in the yadA sequence. The yadA sequence containing the Km cassette was excised from pET-Blue2 by digestion with XmaI and inserted into the corresponding site in the suicide vector pSB890 (5). The resulting plasmid (pSB890-yadA::kan) was used to transform Escherichia coli strain S17-1λpir, which was then conjugated with IP2790 as described previously (5). Insertion of the Km cassette into the yadA locus on the virulence plasmid was achieved using a two-step allelic recombination as previously described (5), except that Yersinia selection medium (Oxoid) supplemented with tetracycline and Km was used to select for integration of pSB890-yadA::kan into the virulence plasmid. Loss of pSB890 and replacement of the WT locus with yadA::kan was achieved by selecting for resistance to sucrose and Km. The resulting strain was used as the WT control. A similar strategy was used to introduce the C172A mutation (16) into the yopJ gene in the WT strain. The C172A mutation corresponds to a change from TGTGGT, encoding Cys172 and Gly173, to GCCGGC, encoding Ala172 and Gly173. This mutation creates a NaeI restriction endonuclease site, which was used to facilitate identification of colonies carrying the mutation. DNA from isolated colonies was used as template in PCR, and the amplified products were tested for susceptibility to cleavage with NaeI. The presence of the mutation was verified by sequence analysis, and the resulting strain was designated YopJC172A. To prepare bacteria for infection, overnight cultures grown at 26°C in Luria-Bertani broth were diluted to OD600 of 0.1 in Luria-Bertani supplemented with 20 mM MgCl2 and 20 mM sodium oxalate. The cultures were shaken at 26°C for 1 h and 37°C for 2 h. Bacteria were washed once and resuspended in HBSS and used to infect macrophages at a multiplicity of infection of 50. The plates or chambers were centrifuged for 5 min at 200 × g to bring the bacteria in contact with the macrophages. If the infection was carried on for >2 h, gentamicin (100 μg/ml final) was added at 2 h postinfection to kill extracellular bacteria. For analysis of Yop secretion, the cultures were prepared and processed as previously described (5), except that the growth time at 37°C was 4 h. Proteins in the supernatant of the bacterial cultures (0.4 ml at OD600 of 0.7) were precipitated with 10% trichloroacetic acid, boiled in 1× Laemmli sample buffer (23), and resolved by 10% SDS-PAGE. The gel was stained with Coomassie brilliant blue and scanned with a Canon N1240U scanner. C57BL/6 mice were obtained from The Jackson Laboratory. Bone marrow-derived macrophages (BMDMs) were obtained as described previously (24). Twenty-four hours before infection, the cells (1 × 106/well) were seeded in 24-well plates in DMEM containing 15% L-cell conditioned medium, 10% heat-inactivated FBS (Invitrogen Life Technologies), 1 mM pyruvate, and 2 mM glutamate. Thirty minutes before infection, cells were changed into fresh medium. J774A.1 cells (and retrovirus-transduced derivatives) were maintained in DMEM containing 10% heat-inactivated FBS. Twenty-four hours before infection, 2.5 × 105 cells were seeded in each well of a 24-well plate. Fresh medium was replaced 30 min before infection, and inhibitors were added as indicated. A DNA fragment encoding a N-terminal flag-tagged IκBα SR was released from the vector pCMV4-IκBα(S32A,S36A) (kindly provided by Dr. D. Ballard, Nashville, TN) and inserted by blunt end ligation into a polylinker upstream of an internal ribosome entry site-enhanced GFP expression cassette in a retroviral vector that was also previously used to express a constitutively active mutant of IKKβ (11). Transduction of cells with this resultant IκBα SR retrovirus results in the uniform coexpression of the IκBα SR and enhanced GFP proteins. Plasmid vectors encoding vesicular stomatitis virus G protein (pMD.G), or gag-pol (pMD.OGP), and retroviral expression vectors encoding myc-tagged A20 and puromycin resistance or GST and puromycin resistance have been described previously (25). 293T cells were seeded at a density of 1 × 106 cells in 6-cm diameter plates and transfected the next day with three plasmids (0.5 μg of pMD.G, 1.5 μg of pMD.OGP, and 2 μg of retroviral DNA vector). The DNA was diluted in 10 μl of LipofectAMINE and 35 μl of PLUS reagent (Invitrogen Life Technologies) in a final volume of 2 ml of DMEM containing 1% nonessential amino acids and 7.5% FBS. After 5 h, 2 ml of DMEM containing 10% FBS were added to each dish, and the medium in each dish was replaced with fresh DMEM containing 10% FBS at 24 h posttransfection. The temperature at which the transfected 293T cells were maintained was then changed from 37°C to 32°C. Thirty-two hours after the temperature shift, the 293T conditioned medium containing retroviral particles was collected, filtered (0.45-μm pore size), and mixed 1:1 with fresh DMEM containing 10% FBS. For transduction with retrovirus producing IκBα SR, J774A.1 cells were seeded at a density of 4 × 104 cells/chamber in eight chamber Lab-Tek Permanox slides (Nunc). The cells were incubated in 293T-conditioned medium for 2 days at 32°C, then in fresh medium overnight at 37°C before bacterial infection. For transduction with retrovirus-producing, myc-tagged A20 or GST, J774A.1 cells (8 × 105) were seeded in 6-cm diameter plates. The cells were incubated in 293T-conditioned medium at 32°C for 24 h to allow for retroviral transduction. The transduced J774A.1 cells were grown at 37°C for an additional 24 h and then subjected to selection with puromycin (2 μg/ml) for 10 days with a daily medium change. The puromycin-resistant cells were maintained in DMEM-10% FBS with 2 μg/ml puromycin and used for experiments within four passages. The cells were changed twice to fresh medium without puromycin 3 h before and 30 min before bacterial infection. Macrophages (2.5 × 105/ml) were infected in 24-well plates. One or 2 h postinfection, tissue culture medium was collected and centrifuged for 5 min at 200 × g. TNF-α in the medium was measured with Quantikine M Mouse TNF-α Immunoassay from R&D Systems following the manufacturer’s instructions. Macrophages (2.5×105/ml) were infected in 24-well plates. LDH released from infected macrophages was measured with CytoTox 96 nonradioactive cytotoxicity assay (Promega), following the manufacturer’s instructions. In each experiment, two independent wells were infected with each bacterial strain. Supernatant from infected wells were collected and stored overnight at −20°C after centrifugation at 200 × g for 10 min. Then LDH content in each well was measured in triplicate. Spontaneous LDH release was determined by assaying supernatants from uninfected cells, and total LDH was determined from uninfected cells that had been lysed by a freeze-thaw cycle. The percentage of LDH release was calculated as follows: percentage of LDH release = (LDHinfected − LDHspontaneous)/(total − LDHspontaneous). Macrophages (1 × 106 cells/well) were infected in 6-well plates. The cells were lysed in boiling 1× Laemmli sample buffer. Samples were resolved by SDS-PAGE (10% acrylamide). Western blotting with commercial primary Abs was done as suggested by the suppliers. Anti-myc (9E10) and anti-IκBα (C-21) Abs were from Santa Cruz Biotechnology. 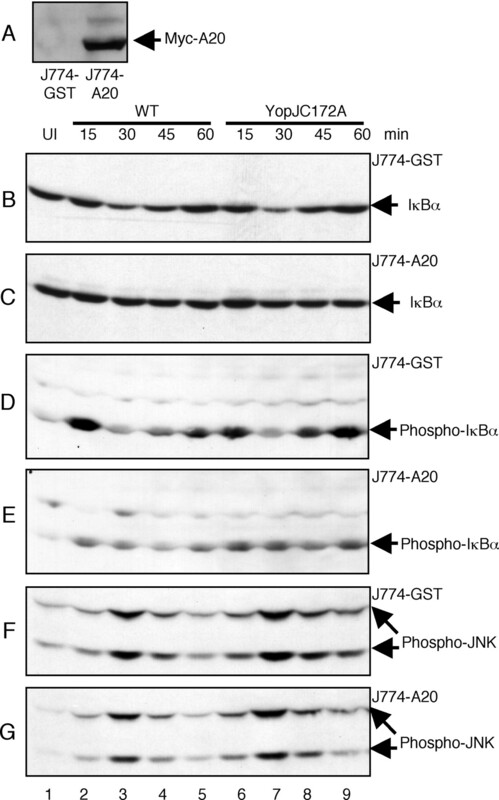 Anti-phospho-IκBα (9241) and anti-phospho-JNK (9255) Abs were from Cell Signaling Technology. Immunoblots were developed with ECL reagents as recommended by the supplier (New England Nuclear). J774A.1 cells cultured in the eight chamber slides were infected for 4 h. The cells were fixed and processed to detect apoptosis using the In Situ Cell Death Detection kit, fluorescein, or TMR red (Roche), according to the manufacturer’s instructions. The slides were mounted in Airvol containing DABCO and analyzed by fluorescence microscopy, using a Zeiss Axioplan2 microscope. Digital images were captured using a SPOT camera (Diagnostic Instruments). The percentage of TUNEL-positive cells among the GFP-positive cells was determined from four random nonoverlapping fields. Macrophages (1 × 106) were infected in 6-well plates. RNA was prepared using a RNeasy Mini kit (Qiagen), following the instructions of the manufacture. RNA integrity was determined by gel electrophoresis. For first-strand cDNA synthesis, 2 μg of total RNA were used in a 20-μl reaction mixture containing oligo(dT)12-18, dNTP mix, 5× first-strand buffer, DTT, RNaseOUT recombinant RNase inhibitor, and SuperScript II (Invitrogen Life Technologies), following manufacturer’s instructions. Biotin-labeled cRNA was prepared according to protocols in the Affymetrix Gene Chip Expression analysis technical manual (Affymetrix). cRNA was hybridized to murine 430A gene chips. Hybridization, washes, Ab amplification, and staining were performed using an Affymetrix Fluidics station. Scanning was performed with a GeneArray scanner. Data were further processed using GeneSpring6.1 (Silicon Genetics). Real-time quantitative PCR was conducted using a QuantiTect SYBR Green PCR kit from Qiagen with the first-strand cDNA synthesized as described above. The sequences of primer pairs used for GAPDH are 5′-ATCACTGCCACCCAGAAGACTG-3′ and 5′-CCCTGTTGCTGTAGCCGTATTC −3′ (product is 430 bp), for Tnf are 5′-AGAAGAGGCACTCCCCCAAAAG-3′ and 5′-AGATAGCAAATCGGCTGACGG-3′ (product is 452 bp), for TNF-α-inducted protein 3 (Tnfaip3) are 5′-GTTTTGCCCACAGTTCCGAGAG-3′ and 5′-GCCATTTTGACCAAGTTGTCCC-3′ (product is 360 bp), and for cFlar are 5′-CCTGCTGATGGAGATTGGTGAG-3′ and 5′-GGATGTGCGGAGGTAAAAAAGC-3′ (product 425 bp). Reactions were conducted on a MJ Research Real-Time PCR Machine in triplicate, and data were collected and analyzed using the Opticon Monitor Software, version 1.02 to 2.08, which determines the cycle number at threshold (Ct) of each gene. The mRNA level of the gene of interest was calculated as the percentage of GAPDH mRNA in the same sample as follows: percentage of GAPDH = POWER(2, CtGAPDH − Ctgene of interest). For the experiment shown in Fig. 9⇓, the data are presented as the ratio of mRNA for Tnf, Cflar, or Tnfaip3 to the mRNA for GAPDH in the same sample. A standard curve was included in each experiment. To study the specific role of YopJ protease activity in promoting apoptosis of macrophages infected with Yersinia, we constructed a Y. pseudotuberculosis strain that was genetically identical to its parent, except that it secreted a catalytically inactive form of YopJ (YopJC172A). The WT and YopJC172A mutant strains secreted full-length YopJ proteins, as well as all other Yops, at equal levels under in vitro conditions that were permissive for type III secretion (Fig. 1⇓). However, as compared with the WT strain, the YopJC172A mutant was specifically defective for promoting apoptosis in infected primary BMDMs as measured by LDH release, which reflects the release of cellular contents during the later phase of apoptosis (Fig. 2⇓A). 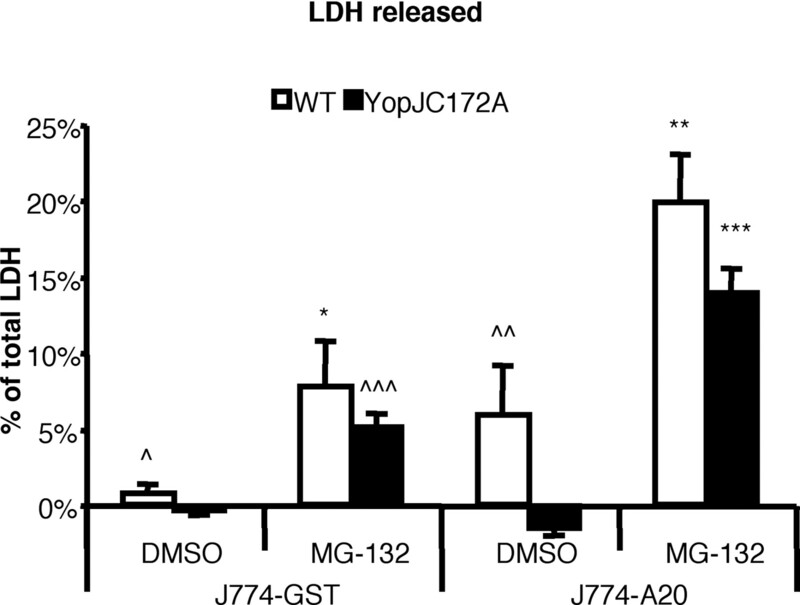 The YopJC172A mutant was also defective in its ability to prevent secretion of TNF-α (Fig. 2⇓B) and to counteract expression of Tnf mRNA (Fig. 2⇓C). These results confirm that the protease activity of YopJ is required for deactivation of the NF-κB pathway and for apoptosis in macrophages infected with Yersinia. 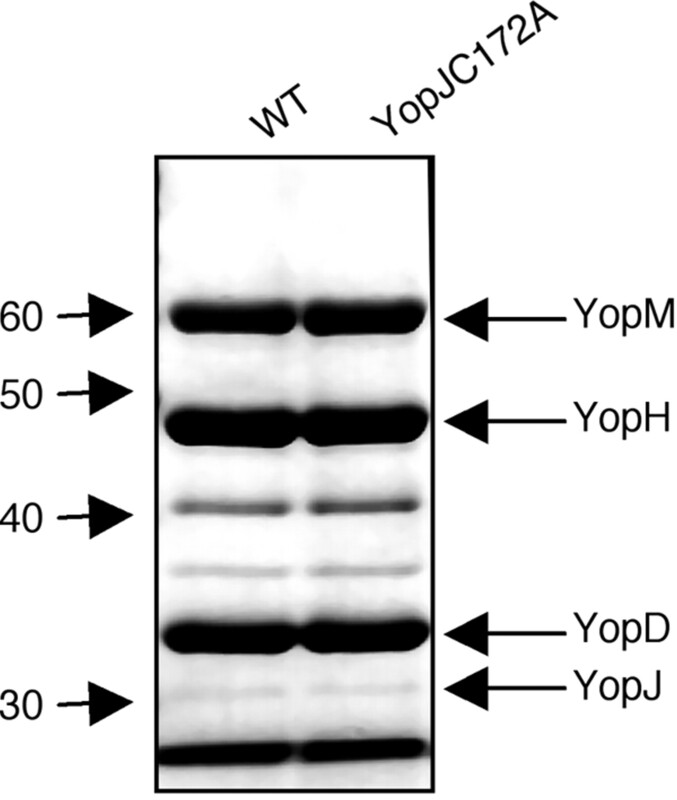 Yops secreted by WT and YopJC172A mutant Y. pseudotuberculosis strains grown under low Ca2+ conditions at 37°C. Sizes in kDa of molecular mass standards are indicated on the left. Positions of Yops are indicated on the right. 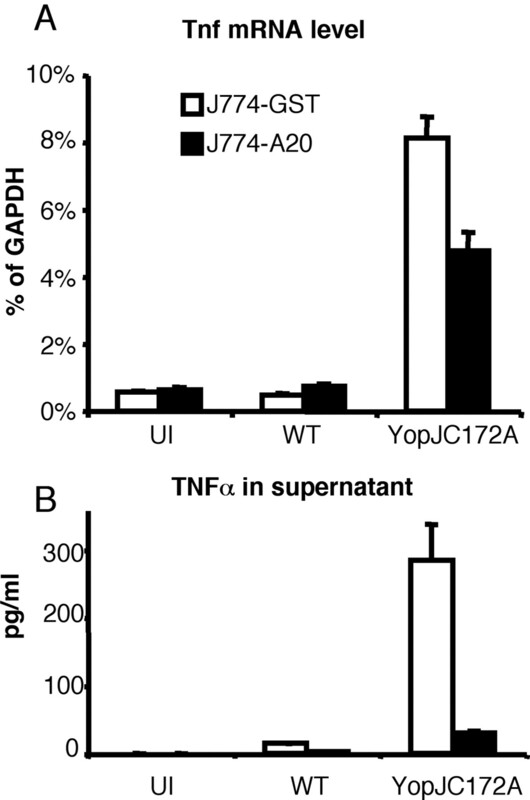 The YopJC172A mutant fails to induce apoptosis of macrophages or prevent TNF-α production. BMDMs were infected with WT or YopJC172A mutant Y. pseudotuberculosis or left uninfected (UI). A, Levels of LDH released in the culture medium was determined at 4, 6, or 8 h postinfection. Data points represent the mean value obtained from duplicated infections. B, BMDMs were infected with WT or YopJC172A for 1 or 2 h as indicated or left UI. TNF-α secreted into the culture medium was measured by ELISA. Data points represent mean values obtained from two infections. C, Levels of mRNA in UI BMDMs, or BMDMs infected with WT or YopJC172A for 2 h were determined by qRT-PCR. Tnf mRNA levels were calculated as the percentage of GAPDH in the same sample. The amount of GAPDH mRNA in WT and YopJC172A-infected BMDMs was 92 ± 21 and 71 ± 12% of uninfected BMDMs (100 ± 4%), respectively. Values represent means and SDs of three experiments. To determine whether deactivation of the NF-κB pathway by YopJ is sufficient for Yersinia-induced apoptosis, we used a bicistronic retroviral vector to express IκBα SR in J774A.1 macrophages. IκBα SR contains the S32A and S36A double mutation that renders it resistant to phosphorylation and subsequent polyubiquitination and degradation. Thus, IκBα SR effectively inhibits NF-κB activation (26). The presence of a GFP gene in the bicistronic vector allowed identification of transfected cells by fluorescence microscopy. J774A.1 cells transduced with the bicistronic vector (J774-IκBαSR-GFP), or a control retrovirus vector producing GFP alone (J774-GFP), were left uninfected or infected for 4 h with WT or YopJC172A mutant bacteria, and apoptosis was measured by TUNEL. If deactivation of the NF-κB pathway is sufficient for Yersinia-induced apoptosis, similar levels of apoptosis should be observed in J774-IκBαSR-GFP cells regardless of the strains used for infection. However, this was not the case because YopJ and IκBα SR seemed to augment each other’s effect in promoting apoptosis. In J774-IκBαSR-GFP cells, apoptosis was ∼5-fold higher when active YopJ was delivered during infection than when inactive YopJ was delivered (25 vs 5% TUNEL-positive cells, respectively; Fig. 3⇓, A and B). 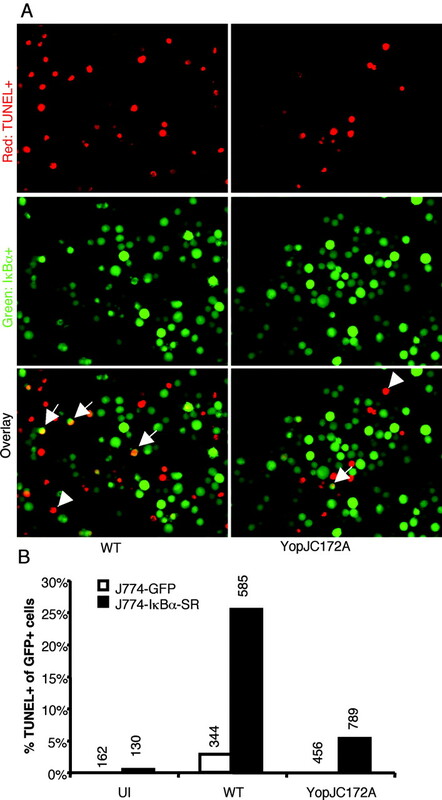 WT bacteria also caused apoptosis in J774-GFP cells, but in this case, only ∼2.5% of the cells were TUNEL positive, ∼10-fold less than in WT-infected J774-IκBαSR-GFP cells (Fig. 3⇓B). In uninfected J774-IκBαSR-GFP cells, there was a low level of spontaneous apoptosis (Fig. 3⇓B), as expected from previous studies, which showed that basal levels of active NF-κB were required for macrophage viability (18, 27). Assuming that IκBα SR completely blocks activation of the NF-κB pathway, these results suggested that deactivation of the NF-κB pathway by YopJ is not sufficient for rapid macrophage apoptosis. Transient expression of IκBα SR promotes YopJ-dependent apoptosis. J774A.1 cells were transduced transiently with retroviruses encoding GFP or IκBα SR and GFP. The transduced cells were infected with either WT or YopJC172A for 4 h or left uninfected (UI). Apoptotic cells were labeled by TUNEL. Fluorescence microscopy was used to count the number of transduced cells (green) that were apoptotic (red). A, Digital photomicrographs showing representative images of cells transduced with the virus producing IκBα SR and GFP and infected with WT or YopJC172A. Arrows indicate transduced cells that were also TUNEL positive (yellow), whereas arrowheads indicate the nontransduced cells that were TUNEL positive (red). B, Percentages of GFP-positive cells that were TUNEL positive in four random nonoverlapping images. The numbers of GFP-positive cells counted under each condition are indicated above the bars. Because long-term expression of IκBα SR leads to spontaneous apoptosis in macrophages (18, 27), we sought an alternative approach to inhibit the NF-κB pathway without affecting the viability of the cells. A20 is a bifunctional ubiquitin-modifying protein that has been shown to inhibit activation of the NF-κB pathway (28). The N-terminal domain of A20 can deubiquitinate receptor-interacting protein (RIP) with Lys63-linked ubiquitin chains, and the C-terminal ligase domain can subsequently polyubiquitinate RIP with Lys48 ubiquitin linkages, leading to proteolysis of RIP (28). As A20 expression has been shown to inhibit activation of the NF-κB pathway downstream of the TLR4R in HEK293 cells (29), we investigated the possibility that A20 could inhibit activation of the NF-κB pathway in response to Yersinia infection. The A20 protein, or an irrelevant control protein (GST), was expressed in J774A.1 cells using a bicistronic retrovirus expression system (25). J774A.1 cells transduced with the retroviruses were selected with puromycin, and pools of drug-resistant cells were used in subsequent experiments. Unlike IκBα SR, long-term expression of A20 did not appear to cause spontaneous apoptosis of the macrophages (data not shown). Expression of the myc-tagged A20 and the GST control protein in the transduced cells was confirmed by immunoblotting (Fig. 4⇓A and data not shown). Stable expression of A20 in J774A.1 cells inhibits activation of NF-κB in response to Y. pseudotuberculosis infection. A, Myc-tagged A20 in total lysates of retrovirally transduced J774A.1 cells (J774-A20) was detected by Western blot analysis with anti-myc Ab. Lysates from J774A.1 cells transduced with retrovirus encoding GST (J774-GST) were analyzed in parallel as a negative control. B–G, J774A-GST (B, D, and F) or J774-A20 (C, E, and G) cells were left uninfected (UI) for 60 min or infected with WT or YopJC172A for the indicated times. Total lysates were analyzed by Western blotting with anti-IκBα (B and C), anti-phospho-IκBα (D and E), or anti-phospho-JNK (F and G) Abs. Results shown are representative of two experiments. To determine whether A20 inhibits NF-κB activation in Yersinia-infected macrophages, we analyzed by immunoblotting the degradation of IκBα, which reflects activation of NF-κB. In GST-expressing cells (J774-GST) infected with YopJC172A mutant bacteria, degradation of IκBα was detected at 30 min postinfection (Fig. 4⇑B, lane 7), and resynthesis of IκBα was detected at 45 and 60 min postinfection (Fig. 4⇑B, lanes 8 and 9). In contrast, in A20-expressing cells (J774-A20), IκBα degradation was not detected throughout the first hour of infection (Fig. 4⇑C, lanes 6–9). Evidence that A20 was blocking infection-induced activation of NF-κB was also obtained when phosphorylation of IκBα was monitored by anti-phospho-IκBα immunoblotting. 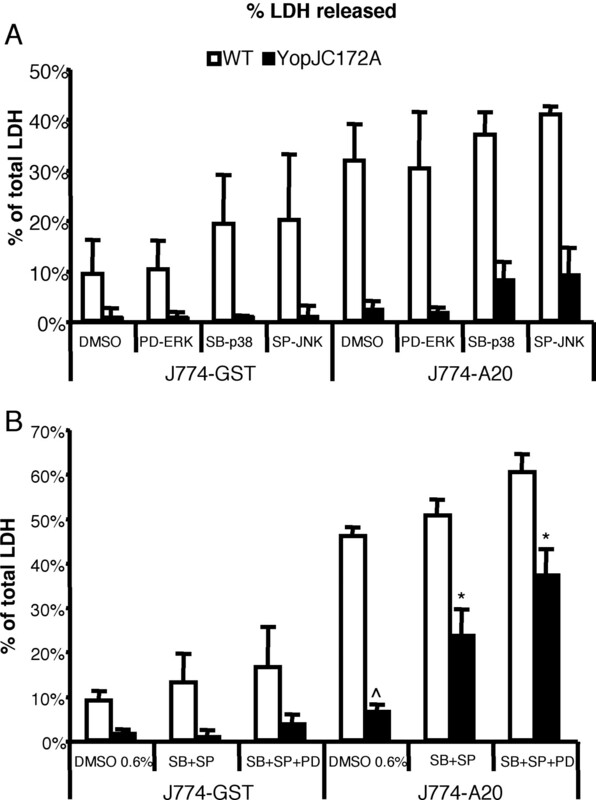 Higher levels of phospho-IκBα were detected in the infected J774-GST cells than in the J774-A20 cells (Fig. 4⇑, D and E, lanes 6, 8, and 9). In contrast, the activation of JNK, as indicated by anti-phospho-JNK immunoblotting, was similar in both groups of cells (Fig. 4⇑, F and G, lanes 6–9), showing that the effect of A20 was specific for the NF-κB pathway. Similar results were obtained in the cells infected with WT bacteria, although in this case, the inhibitory effects of YopJ on the NF-κB- and JNK-signaling pathways could be seen beginning at the 45-min time point. Reduced phosphorylation of IκBα in J774-GST cells was evident at the 45- and 60-min time points (Fig. 4⇑D, compare lanes 4 and 5 with 8 and 9), and decreased phosphorylation of JNK was seen in both types of cells at the 45- and 60-min time points (Fig. 4⇑, F and G, compare lanes 4 and 5 with 8 and 9). We further explored the ability of A20 to inhibit NF-κB activation in Yersinia-infected macrophages by measuring expression of Tnf mRNA and secretion of TNF-α. In J774-A20 cells infected with the YopJC172A mutant, the level of Tnf message was reduced ∼2-fold compared with J774-GST cells (Fig. 5⇓A). In addition, expression of A20 reduced secretion of TNF-α by ∼10-fold in macrophages infected with the YopJC172A mutant (Fig. 5⇓B). Collectively, these results revealed that A20 inhibits Yersinia infection-induced activation of NF-κB in macrophages. Stable expression of A20 in J774A.1 cells inhibits production of TNF-α in response to Y. pseudotuberculosis infection. A, J774-GST or J774-A20 cells were left uninfected (UI) or infected with WT or YopJC172A for 2 h. Tnf mRNA was quantified by qRT-PCR and normalized as the percentage of GAPDH mRNA in the same sample. The amount of GAPDH mRNA in WT- and YopJC172A-infected J774-GST cells was 52 ± 3 and 77 ± 9%, respectively, of the GAPDH mRNA in UI J774-GST cells. The amounts of GAPDH mRNA in the UI and WT- and YopJC172A-infected J774-A20 cells was 75 ± 10, 75 ± 5, and 85 ± 3%, respectively, of the GAPDH mRNA in the UI J774-GST cells. Values represent means and SDs of three reactions on the same samples from a single experiment and are representative of two experiments. B, J774-GST or J774-A20 cells were infected with WT or YopJC172A for 2 h or left UI. The concentration of TNF-α secreted in the tissue culture medium was determined with ELISA. Data presented are means and SDs of four samples from two experiments. 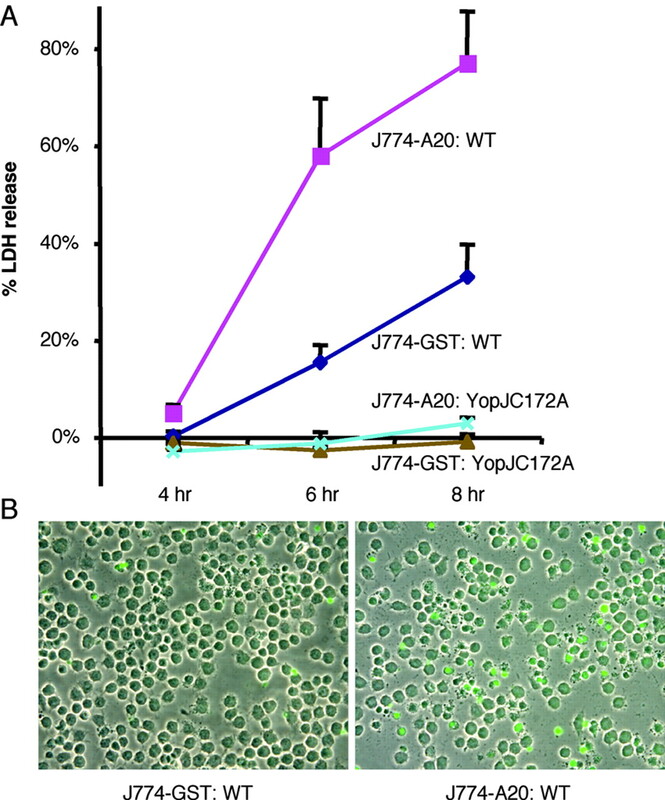 To assess the effect of A20 in YopJ-dependent apoptosis, J774-A20 or J774-GST cells were infected with WT or YopJC172A mutant bacteria, and apoptosis was measured by LDH release or TUNEL. Similar to the results obtained with IκBα SR-expressing cells, the effects of NF-κB inhibition and YopJ were not redundant. In the J774-A20 cells, as detected either by TUNEL staining or LDH release (Fig. 6⇓, A and B), WT bacteria caused extensive cell death between 4 and 8 h postinfection, whereas the cell death in YopJC172A mutant-infected cells was still negligible. Similar to expression of IκBα SR, expression of A20 also promoted faster apoptosis in the WT-infected cells. In J774-A20 cells infected with WT bacteria, LDH release increased from 5 to 77% between 4 and 8 h postinfection. In contrast, LDH release increased from 0.1 to 33% during the same time period in J774-GST cells infected with WT bacteria (Fig. 6⇓, A and B). Collectively, these results argue that deactivation of the NF-κB pathway is not sufficient to promote the rapid apoptosis of macrophages in response to Yersinia infection and suggest that YopJ interferes with other signaling pathways to promote apoptosis in macrophages. Stable expression of A20 promotes YopJ-dependent apoptosis. A, J774-GST or J774-A20 cells were left uninfected or were infected with WT or YopJC172A for 4, 6, or 8 h. The percentage of LDH released into the medium was determined from duplicate infections. Data shown are means and SDs of four independent samples from two similar experiments. B, J774-GST or J774-A20 cells were infected with WT for 4 h, and apoptotic cells (green nuclei) were detected with TUNEL assay. Because YopJ inhibits not only the activation of NF-κB but multiple MAPKs as well, we investigated the possibility that these kinases become key survival factors after NF-κB inhibition. Previous studies indicated that inhibition of MAPKs alone could not substitute for the function of YopJ in Yersinia-induced apoptosis (8), yet in these experiments, it was likely that active NF-κB masked any effects of the MAPKs in promoting survival. Initially, we used specific inhibitors to evaluate the individual roles of ERK (30), p38 (31), and JNK (32). J774-A20 or J774-GST cells were treated with one of the inhibitors or vehicle (DMSO), and following a 4-h infection, Yersinia-induced apoptosis was measured by LDH release. The ERK inhibitor by itself did not increase apoptosis in either cell type (Fig. 7⇓A). Treatment with either the p38 or the JNK inhibitor appeared to increase apoptosis in J774-GST cells infected with WT and in J774-A20 cells infected with either strain, although the increases relative to the control were not statistically significant (Fig. 7⇓A). In J774-A20 cells, where the NF-κB pathway was inhibited, a combination of MAPK inhibitors more closely mimicked the effect of YopJ. In particular, when J774-A20 cells were treated with the p38 and JNK inhibitors before infection with the YopJC172A mutant, apoptosis was increased 3-fold over the control (Fig. 7⇓B). An additional increase in apoptosis was seen in YopJC172A-infected J774-A20 cells treated with all three inhibitors, but this increase was not significantly different from the result obtained with just the combination of p38 and JNK inhibitors (Fig. 7⇓B). This result suggested that inhibition of p38 and JNK activity, in addition to inhibition of NF-κB activation, is important for rapid Yersinia-induced macrophage apoptosis. Effect of inhibitors of MAPKs on macrophage apoptosis induced by Y. pseudotuberculosis infection. A, J774-GST and J774-A20 cells were pretreated with DMSO (0.2%) or individual inhibitors in 0.2% of DMSO for 30 min, then infected with WT or YopJC172A or left uninfected for 6 h. The percentage of LDH released into the tissue culture medium was determined. The inhibitors used were as follows: PD98059, 20 μM (PD-ERK); SB202190, 10 μM (SB-p38); and SP600125, 20 μM (SP-JNK). Results shown are means and SDs calculated from results of two independent experiments in which each experiment had two infections for each condition. B, J774-GST and J774-A20 cells were pretreated with DMSO (0.6%) or combinations of inhibitors in 0.6% of DMSO as indicated for 30 min, then infected with WT or YopJC172A or left uninfected for 5 h. The percentage of LDH released into the tissue culture medium was determined. Results shown are means and SDs calculated from results of four independent infections from two experiments. By one-way ANOVA, it was found that the variation among the means of the percentage of LDH release is significantly greater (p < 0.0001) than expected by chance. The variations between each individual condition were then posttested with Tukey-Kramer multiple comparisons test. In YopJC172A mutant-infected J774-A20 cells, pretreatment of two or three inhibitors (indicated with ∗) caused a significant difference (p < 0.01) in LDH release compared with the pretreatment of DMSO alone (indicated with ^). Our finding that inhibition of the NF-κB pathway was not sufficient for Yersinia-induced apoptosis prompted us to re-evaluate the role of the proteasome in the process. Previously, MG-132 was found to mimic the effect of YopJ in promoting Yersinia-induced apoptosis (8). Although MG132 does inhibit proteolysis of IκBα and prevent activation of NF-κB, it also inhibits the degradation of many other cellular proteins that are polyubiquitinated. Taking advantage of the A20-expressing macrophages where NF-κB activation is blocked, we examined whether the effects of proteasome inhibition and NF-κB inhibition were redundant in Yersinia-induced apoptosis. As expected (8), MG-132 treatment could replace YopJ function in inducing macrophage apoptosis during infection (J774-GST cells, infected with YopJC172A; Fig. 8⇓). Surprisingly, we also noticed that MG-132 treatment augmented YopJ-dependent cell death: in the control J774-GST cells infected with WT bacteria, levels of LDH released increased from 0.8 to 8% with MG-132 treatment (Fig. 8⇓). Similarly, in J774-A20 cells infected with WT bacteria, LDH levels increased from 6 to 20% with MG-132 treatment (Fig. 8⇓). In addition, the effect of NF-κB inhibition was additive with the effects of YopJ and MG-132. Levels of LDH released from MG-132-treated J774-A20 cells were similar, whether they were infected with WT or YopJC172A mutant bacteria (20 vs 15%, respectively), but these levels were ∼2-fold higher than those observed in MG132-treated J774-GST cells (Fig. 8⇓). Similar results were obtained with a different proteasome inhibitor, epoxomicin, which also augmented YopJ-dependent cell death (data not shown). These results suggest that enhancement of Yersinia-induced apoptosis by blocking proteasome function is not simply due to inhibition of IκBα proteolysis and NF-κB activation. It is possible that the stabilization of other polyubiquitinated proteins plays a role in promoting apoptosis under these conditions. Effect of a proteasome inhibitor (MG-132) on macrophage apoptosis induced by Y. pseudotuberculosis infection. J774-GST and J774-A20 cells were pretreated with DMSO (0.1%) or MG-132 (10 μM) for 30 min, then infected with WT or YopJC172A or left uninfected for 4 h. The percentage of LDH released into the tissue culture medium was determined. Results shown are a summary of three independent experiments. Statistical analysis was done as described in the legend to Fig. 7⇑. The role of MG-132 in Yersinia infection-induced apoptosis is assessed in the following statistical results: first, in J774-GST cells infected with WT, pretreatment with MG-132 (∗) caused a significant difference (p < 0.05) in LDH release compared with DMSO treatment (^). Secondly, in J774-A20 cells infected with WT, pretreatment with MG-132 (∗∗) also caused a significant difference (p < 0.001) compared with DMSO treatment (^^). The combination effect of A20 and MG-132 treatment in Yersinia infection-induced apoptosis is also evaluated in two comparisons: in MG-132-treated cells infected with WT, J774-A20 (∗∗) has a significant difference (p < 0.001) compared with J774-GST (∗) in LDH release. In MG-132-treated cells infected with YopJC172A, J774-A20 (∗∗∗) also has a significant difference (p < 0.01) in LDH release compared with the control J774-GST cells (^^^). The results described above suggest that MAPK and NF-κB pathways activated in response to bacterial infection function to induce expression of gene(s) whose products inhibit apoptosis in macrophages. In an attempt to identify such genes, we performed microarray analysis on BMDMs that were left uninfected or were infected with the WT strain or the YopJC172A mutant for 2 h. This time point was chosen because we had observed a clear difference in Tnf message levels in BMDMs infected with WT or YopJC172A mutant bacteria at this time point (Fig. 2⇑C). Total RNAs were collected, processed, and analyzed using the Affymetrix GeneChip Mouse Expression Array 430A, which contains 22,690 probe sets encoding ∼14,000 genes. Although some of the probe sets encode the same genes, they could represent different splicing forms, and in the following description, we will inclusively call them “genes.” The experiment was done twice with independently prepared BMDMs. The resulting data were analyzed using GeneSpring 6.1. Among the 22,690 genes, 12,046 were flagged by the Affymetrix Suite analysis software as present or marginally present in at least one condition (uninfected or infected with WT or YopJC172A mutant bacteria). Among these 12,046 genes, 794 were regulated differentially (defined here as an increase or decrease of ≥2-fold) between uninfected and WT-infected conditions, and 1,073 were regulated differentially between uninfected and YopJC172A-infected conditions. Collectively, 1232 genes were regulated differentially by infection with either strain (infection induced group), with 635 genes differing under both infection conditions (common group), which indicated that the overall response of the macrophages to the two different bacterial strains was similar. The number of genes differentially expressed between WT- and YopJC172A mutant-infected cells (YopJ-regulated group) was much smaller (266). Forty-nine of these genes were not present in the infection-induced group. Seventy-one genes in the YopJ-regulated cluster were part of the common group. These genes encoded many chemokines and cytokines, such as CCL2, CCL3, CCL7, Csf2 (GM-CSF2), CXCL1 and CXCL2 (MIP2), IL-1α and IL-1β, IL-6, IL-10, IL-12β, and TNF-α. Among all genes that were regulated differentially between any two conditions, there were 38 genes and 1 expressed sequence tag annotated in GeneSpring as related to apoptosis. Five of these genes encode apoptosis inhibitors that can be regulated by NF-κB (Table I⇓). For example, FLIP, the protein encoded by the Cflar gene, has been shown to inhibit LPS-induced apoptosis in endothelial cells (33). Contrary to our expectations, Cflar, as well as the other four genes with known survival functions, did not belong to the YopJ-regulated group, although their expression fluctuated with infection (Table I⇓). Thus, YopJ did not appear to have a significant inhibitory effect on the expression of known antiapoptosis genes, at least as determined by microarray analysis of mRNA levels at 2 h postinfection. To examine further the effect of YopJ activity on the expression of antiapoptosis genes during infection, we measured the expression of the Cflar gene as an example of the apoptotic genes and compared its mRNA levels with that of Tnf after 1, 2, and 3 h of infection using qRT-PCR. As shown in Fig. 9⇓, the mRNA levels for Tnf were lower in the WT-infected cells than in YopJC172A-infected cells at all three time points. In comparison, the mRNA level of Cflar in WT-infected cells was similar to that in YopJC172A-infected cells at 1- and 2-h time points, whereas a significant difference (p < 0.01) in Cflar mRNA levels was seen at a 3-h time point (Fig. 9⇓). These data suggest that inhibition of MAPK and NF-κB activation by YopJ during infection has different consequences for the expression of proinflammatory genes and antiapoptotic genes in macrophages. Expression levels of Tnf, Tnfaip3, and Cflar mRNA during infection. BMDMs were left uninfected (UI) for 3 h or infected with WT or YopJC172A for 1, 2, or 3 h as indicated. Tnf, Tnfaip3, and Cflar mRNA levels were quantified by qRT-PCR and normalized as a ratio to GAPDH mRNA levels in the same sample. Values represent means and SDs of three independent experiments. Statistical analysis was done as described in the legend to Fig. 7⇑. The differences in levels of Cflar mRNA were statistically different at the 3-h time point (p < 0.01). The microarray result also showed that there were seven genes belonging to the YopJ-regulated group with functions related to apoptosis but not in the context of promoting survival (Table I⇑). Interestingly, one of the genes that was expressed >2-fold higher in YopJC172A mutant-infected macrophages than in WT-infected macrophages is Tnfaip3, which encodes the murine homologue of A20, and is a bona fide NF-κB target gene (34). Using qRT-PCR, we confirmed that Tnfaip3 mRNA levels were higher in BMDMs infected with YopJC172A mutant bacteria as compared with WT-infected BMDMs through out the first 3 h (Fig. 9⇑). Tnfaip3 and A20 are 85% identical at the amino acid level, suggesting that Tnfaip3 also functions to inhibit activation of NF-κB. Because Tnfaip3 is expressed at higher levels in YopJC172A mutant-infected than in WT-infected macrophages and YopJC172A mutant-infected cells do not undergo apoptosis, these results further suggest that inhibition of NF-κB is not sufficient for Yersinia-induced apoptosis. The pathogenic Yersinia spp. have proven to be a useful model for studying how pathogens subvert host signaling responses for their own benefit. As with many other pathogenic bacteria, these bacteria use a type III secretion system to deliver a set of bacterial proteins into host cells. So far, six effector proteins, which can modulate host signaling responses, have been identified in Yersinia (1). YopJ is required for Yersinia to deactivate the NF-κB- and MAPK-signaling pathways and to induce apoptosis in macrophages (4). Previous studies established that inhibition of NF-κB by YopJ is necessary for Yersinia-induced apoptosis (8, 11, 18). This study was undertaken to determine whether deactivation of the NF-κB pathway by YopJ is sufficient for induction of macrophage apoptosis. The earlier studies evaluating the function of YopJ used Yersinia strains that carried null mutations in yopJ and multicopy plasmids expressing WT or catalytically inactive YopJ proteins (16, 35). To specifically study the effect of YopJ protease activity in promoting apoptosis, we introduced the C172A mutation into the yopJ gene on the virulence plasmid. Therefore, except for four nucleotides and one amino acid residue, our WT and mutant strains were isogenic. Using this pair of strains, we could be sure that the WT and inactive YopJ proteins would be expressed and translocated at native levels during macrophage infection. The C172A mutation did not affect the secretion of Yops under low Ca2+ conditions (Fig. 1⇑) or the translocation of YopJ into host cells (data not shown). However, unlike the WT strain, the YopJC172A mutant did not cause macrophages to undergo apoptosis during infection (Fig. 2⇑A) and did not suppress the production of Tnf mRNA or protein (Fig. 2⇑, B and C). To address the hypothesis that deactivation of the NF-κB pathway by YopJ is sufficient to cause apoptosis, we expressed in J774A.1 cells the IκBα SR, or A20, and then infected these cells with WT or YopJC172A mutant Y. pseudotuberculosis. As previously reported (27), inhibition of basal NF-κB activation by long-term expression of IκBα SR resulted in macrophage death. However, using transient expression conditions and minimizing the time between transfection and infection, we were able carry out experiments when the level of spontaneous apoptosis was relatively low (Fig. 3⇑). YopJ and IκBα SR clearly augmented each other’s effects because high levels of apoptosis were observed in J774-IκBαSR cells infected with WT Y. pseudotuberculosis (Fig. 3⇑). In contrast, much lower levels of apoptosis were seen when either YopJ or IκBα SR were present individually in the cells, as in the case of the control J774-GFP cells infected with WT bacteria (no IκBα SR) or the J774-IκBα SR cells infected with YopJC172A (no YopJ activity) (Fig. 3⇑). Similar results were obtained with J774A.1 cells expressing A20, although in this case, we did not observe spontaneous apoptosis following transfection and were able to select for stable expression of A20 in pools of these cells (Fig. 6⇑). Overall, these results indicated that YopJ is doing more than just deactivating the NF-κB pathway to promote rapid macrophage apoptosis. A20 functions sequentially as a deubiquitination enzyme (DUB) and then as a ubiquitin ligase, and one potential target of A20 is RIP (28). It is interesting to point out that A20 and YopJ may share similar biochemical functions. Both YopJ and the DUB domain of A20 are cysteine proteases. The DUB domain of A20 specifically removes the K63 ubiquitin modification of RIP, which correlates with the inactivation of RIP (28). It is possible that YopJ cleaves off a similar transient ubiquitin modification from its target (4). Although both A20 and YopJ can inhibit the NF-κB pathway, YopJ is distinct in that it also deactivates multiple MAPK pathways. Under our experimental conditions, we found that inhibition of individual ERK, JNK, or p38 MAPKs, even together with inhibition of the NF-κB pathway (as in the case of J774-A20 cells), did not significantly promote apoptosis during the 6 h of infection with YopJC172A (Fig. 7⇑A). However, inhibition of p38, JNK, and the NF-κB pathway simultaneously did promote significant apoptosis in YopJC172A-infected macrophages over the same time period, and in a sense, these conditions mimicked the effect of WT YopJ (Fig. 7⇑B). These results indicated that MAPKs, especially p38 and JNK, also participate in promoting macrophage survival following bacterial infection. Recently, it was reported that inhibition of the p38 pathway alone by anthrax lethal factor promotes macrophage apoptosis in response to LPS stimulation (36). Although this apoptotic process is achieved in the absence of NF-κB inhibition, the macrophages die much more slowly (∼18 h posttreatment with LPS) than observed with Yersinia-infected macrophages. One possibility is that p38 and NF-κB cooperate to initiate the transcription of a gene, which encodes a key apoptosis inhibitor. In this scenario, the inhibition of either p38 or NF-κB will lead to inefficient expression of this key protein, thus the cells will die by a slower mechanism than if both p38 and NF-κB were inhibited. NF-κB and p38 can cooperatively regulate transcription of certain genes in that inhibition of either one will reduce the mRNA level. Tnf is one such gene, although it does not encode a survival protein. After infection with the YopJC172A mutant, Tnf message was reduced ∼2-fold in the J774-A20 cells where NF-κB is inhibited in comparison to the mRNA level in the control J774-GST cells (Fig. 5⇑A). Similarly, anthrax lethal factor, which inhibits p38, also caused a partial reduction in Tnf mRNA level in macrophages stimulated with LPS compared with the cells just stimulated with LPS (36). Our results suggest that p38, JNK, and NF-κB promote expression of survival genes in Yersinia-infected macrophages. In an attempt to identify these genes, we conducted microarray analysis. Consistent with other studies that analyzed the effects of YopJ in macrophages using microarray (37, 38), we found that YopJ strongly inhibits the expression of many genes, especially those encoding cytokines. However, YopJ did not strongly decrease the expression of many apoptosis-regulating genes: the mRNA levels of several apoptosis inhibitor genes were similar between WT and YopJC172A mutant infected samples at the 2-h time point (Table I⇑). In addition, of the six apoptosis-related genes that were down-regulated by YopJ by >2-fold, two of them, Phlda1 and Plagl1, encode apoptosis promoting factors (39, 40), and their expression levels are higher in the cells that survived (Table I⇑). The nearly completed human genome has allowed the systematic identification of genes encoding the known domains that play important roles in regulating apoptosis (41). A similar degree of complexity is expected in the way murine cells regulate apoptosis. Therefore, it is unlikely that we failed to detect an important antiapoptosis gene that is down-regulated by YopJ. The small differences in apoptosis inhibitor mRNA levels we observed between the WT- and YopJC172A-infected cells could be important, although they did not reach the 2-fold difference threshold we set in the microarray analysis (Table I⇑). Alternatively, the differences in mRNA levels could be greater at either earlier or later than the 2-h time point we chose, as was observed in the case of the Cflar gene (Fig. 9⇑). Another possibility is that the production of antiapoptosis proteins is also regulated posttranscriptionally, so that even if mRNA levels are similar in WT- and YopJC172A mutant-infected macrophages, the protein levels could be quite different. Protein degradation through proteasome may also play an important role in Yersinia-promoted apoptosis. In agreement with previous studies (8), we also found that inhibition of proteasome by MG-132 could substitute for the function of YopJ in promoting rapid apoptosis (Fig. 8⇑). However, the effect of MG-132 is additive with WT YopJ in driving the progress of apoptosis, and inhibition of the NF-κB pathway in the J774-A20 cells speeds apoptosis additionally (Fig. 8⇑). Clearly, MG-132 can promote apoptosis cooperatively with YopJ and NF-κB inhibition. In leukemic cells, inhibition of proteasome together with LPS treatment leads to an increase in Bcl-2 cleavage (42). Bcl-2 is a prosurvival protein that regulates the permeability of mitochondria so that increased Bcl-2 cleavage results in cell death. Therefore, inhibition of the proteasome can interfere with apoptotic regulation by different mechanisms other than just inhibiting IκB degradation. Similar observations need to be established to understand how proteasome inhibition could promote Yersinia-induced apoptosis. Collectively, we propose the following model: the encounter with a pathogen will activate macrophages, which results in the activation of both pro- and antiapoptotic pathways. The survival pathway includes but may not be limited to the NF-κB and MAPK pathways, as well as the proteasome (Fig. 10⇓). The antiapoptotic pathways are intertwined with those that initiate inflammation so that in the beginning the effect of apoptotic pathways is balanced out. However, with the control of the infection, the strength of the survival pathway is decreased until the proapoptotic pathway dominates to eliminate the activated macrophages that are no longer needed. The decision is controlled by many factors and layers of mechanisms, including but not limited to transcription, translation, and protein degradation. This allows the cells to accurately determine quantitatively the magnitude and duration of infection and subsequently the duration of activation before setting on the path of no return. Thus, the effects of inhibitory mechanisms are additive (e.g., Fig. 8⇑) in causing apoptosis. Interestingly, many steps along these pathways are subject to hijacking by pathogens for their own benefit. A model of pathways activated by Yersinia-infection in macrophages. The shaded steps indicate components in the apoptosis pathway, whereas the unshaded steps indicate components of the survival pathway. The steps where YopJ, A20, and MG-132 interfered are also indicated. Question marks indicate not well-established connections. We thank members of the Bliska laboratory for comments and suggestions, and the entire Center for Infectious Diseases (State University of New York, New York, NY) for support and help. In particular, we thank Drs. Jizu Zhi and Sean Connolly for help in setting up the GeneSpring software, and John Schwedes for processing arrays in the University DNA Microarray Core Facility. ↵1 This work is supported National Institutes of Health Grants AI43389 and AI53759 (to J.B.B.) and GM066882 (to K.B.M.). K.B.M. is a Senior Scholar of the Institute of Advanced Studies of the University of Bologna. ↵3 Abbreviations used in this paper: Yop, Yersinia outer protein; WT, wild type; IKKβ, IκB kinase β; MKK, MAPK kinase; IκBα SR, IκBα superrepressor; Km, kanamycin; BMDM, bone marrow-derived macrophage; LDH, lactate dehydrogenase; Ct, threshold; Tnfaip3, TNF-α-inducted protein 3; RIP, receptor-interacting protein; qRT-PCR, qualitative RT-PCR; DUB, deubiquitination enzyme. Cornelis, G. R., A. Boland, A. P. Boyd, C. Geuijen, M. Iriarte, C. Neyt, M. P. Sory, I. Stainier. 1998. The virulence plasmid of Yersinia, an antihost genome. Microbiol. Mol. Biol. Rev. 62: 1315-1352. Monack, D. M., J. Mecsas, N. Ghori, S. Falkow. 1997. Yersinia signals macrophages to undergo apoptosis and YopJ is necessary for this cell death. Proc. Natl. Acad. Sci. USA 94: 10385-10390. Mills, S. D., A. Boland, M. P. Sory, P. van der Smissen, C. Kerbourch, B. B. Finlay, G. R. Cornelis. 1997. Yersinia enterocolitica induces apoptosis in macrophages by a process requiring functional type III secretion and translocation mechanisms and involving YopP, presumably acting as an effector protein. Proc. Natl. Acad. Sci. USA 94: 12638-12643. Orth, K.. 2002. Function of the Yersinia effector YopJ. Curr. Opin. Microbiol. 5: 38-43. Palmer, L. E., S. Hobbie, J. E. Galan, J. B. Bliska. 1998. 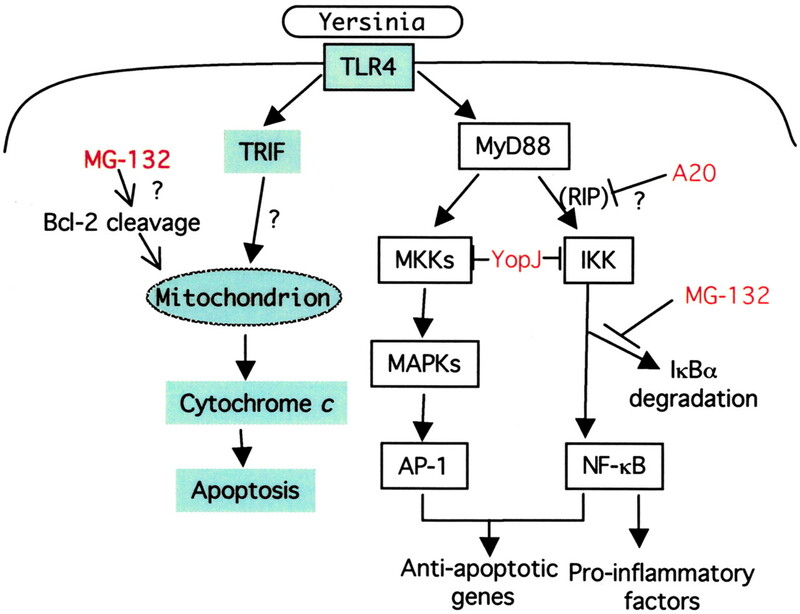 YopJ of Yersinia pseudotuberculosis is required for the inhibition of macrophage TNF-α production and down-regulation of the MAP kinases p38 and JNK. Mol. Microbiol. 27: 953-965. Ruckdeschel, K., J. Machold, A. Roggenkamp, S. Schubert, J. Pierre, R. Zumbihl, J. P. Liautard, J. Heesemann, B. Rouot. 1997. Yersinia enterocolitica promotes deactivation of macrophage mitogen-activated protein kinases extracellular signal-regulated kinase-1/2, p38, and c-Jun NH2-terminal kinase: correlation with its inhibitory effect on tumor necrosis factor α production. J. Biol. Chem. 272: 15920-15927. Boland, A., G. R. Cornelis. 1998. Role of YopP in suppression of tumor necrosis factor α release by macrophages during Yersinia infection. Infect. Immun. 66: 1878-1884. Ruckdeschel, K., S. Harb, A. Roggenkamp, M. Hornef, R. Zumbihl, S. Kohler, J. Heesemann, B. Rouot. 1998. Yersinia enterocolitica impairs activation of transcription factor NF-κB: involvement in the induction of programmed cell death and in the suppression of the macrophage tumor necrosis factor α production. J. Exp. Med. 187: 1069-1079. Schesser, K., A. K. Spiik, J. M. Dukuzumuremyi, M. F. Neurath, S. Pettersson, H. Wolf-Watz. 1998. The yopJ locus is required for Yersinia-mediated inhibition of NF-κB activation and cytokine expression: YopJ contains a eukaryotic SH2-like domain that is essential for its repressive activity. Mol. Microbiol. 28: 1067-1079. Haase, R., C. J. Kirschning, A. Sing, P. Schrottner, K. Fukase, S. Kusumoto, H. Wagner, J. Heesemann, K. Ruckdeschel. 2003. A dominant role of Toll-like receptor 4 in the signaling of apoptosis in bacteria-faced macrophages. J. Immunol. 171: 4294-4303. Zhang, Y., J. B. Bliska. 2003. Role of Toll-like receptor signaling in the apoptotic response of macrophages to Yersinia infection. Infect. Immun. 71: 1513-1519. Ghosh, S., M. Karin. 2002. Missing pieces in the NF-κB puzzle. Cell 109:(Suppl. ): S81-S96. Orth, K., L. E. Palmer, Z. Q. Bao, S. Stewart, A. E. Rudolph, J. B. Bliska, J. E. Dixon. 1999. Inhibition of the mitogen-activated protein kinase kinase superfamily by a Yersinia effector. Science 285: 1920-1923. Orth, K., Z. Xu, M. B. Mudgett, Z. Q. Bao, L. E. Palmer, J. B. Bliska, W. F. Mangel, B. Staskawicz, J. E. Dixon. 2000. Disruption of signaling by Yersinia effector YopJ, a ubiquitin-like protein protease. Science 290: 1594-1597. Ruckdeschel, K., O. Mannel, K. Richter, C. A. Jacobi, K. Trulzsch, B. Rouot, J. Heesemann. 2001. Yersinia outer protein P of Yersinia enterocolitica simultaneously blocks the nuclear factor-κB pathway and exploits lipopolysaccharide signaling to trigger apoptosis in macrophages. J. Immunol. 166: 1823-1831. Van Antwerp, D. J., S. J. Martin, T. Kafri, D. R. Green, I. M. Verma. 1996. Suppression of TNF-α-induced apoptosis by NF-κB. Science 274: 787-789. Wang, C. Y., M. W. Mayo, A. S. Baldwin, Jr. 1996. TNF- and cancer therapy-induced apoptosis: potentiation by inhibition of NF-κB. Science 274: 784-787. Simonet, M., S. Falkow. 1992. Invasin expression in Yersinia pseudotuberculosis. Infect. Immun. 60: 4414-4417. Alexeyev, M. F.. 1995. Three kanamycin resistance gene cassettes with different polylinkers. Biotechniques 18: 52-, 54, 56. Harlow, E., D. Lane. 1998. Antibodies: A Laboratory Manual Cold Spring Harbor Laboratory, Cold Spring Harbor, NY. .
Celada, A., P. W. Gray, E. Rinderknecht, R. D. Schreiber. 1984. Evidence for a γ-interferon receptor that regulates macrophage tumoricidal activity. J. Exp. Med. 160: 55-74. He, K. L., A. T. Ting. 2002. A20 inhibits tumor necrosis factor (TNF) α-induced apoptosis by disrupting recruitment of TRADD and RIP to the TNF receptor 1 complex in Jurkat T cells. Mol. Cell. Biol. 22: 6034-6045. Chen, Z., J. Hagler, V. J. Palombella, F. Melandri, D. Scherer, D. Ballard, T. Maniatis. 1995. Signal-induced site-specific phosphorylation targets IκBα to the ubiquitin-proteasome pathway. Genes Dev. 9: 1586-1597. Wertz, I. E., K. M. O’Rourke, H. Zhou, M. Eby, L. Aravind, S. Seshagiri, P. Wu, C. Wiesmann, R. Baker, D. L. Boone, et al 2004. De-ubiquitination and ubiquitin ligase domains of A20 down-regulate NF-κB signalling. Nature 430: 694-699. O’Reilly, S. M., P. N. Moynagh. 2003. Regulation of Toll-like receptor 4 signalling by A20 zinc finger protein. Biochem. Biophys. Res. Commun. 303: 586-593. Dudley, D. T., L. Pang, S. J. Decker, A. J. Bridges, A. R. Saltiel. 1995. A synthetic inhibitor of the mitogen-activated protein kinase cascade. Proc. Natl. Acad. Sci. USA 92: 7686-7689. Lee, J. C., J. T. Laydon, P. C. McDonnell, T. F. Gallagher, S. Kumar, D. Green, D. McNulty, M. J. Blumenthal, J. R. Heys, S. W. Landvatter, et al 1994. A protein kinase involved in the regulation of inflammatory cytokine biosynthesis. Nature 372: 739-746. Bennett, B. L., D. T. Sasaki, B. W. Murray, E. C. O’Leary, S. T. Sakata, W. Xu, J. C. Leisten, A. Motiwala, S. Pierce, Y. Satoh, et al 2001. SP600125, an anthrapyrazolone inhibitor of Jun N-terminal kinase. Proc. Natl. Acad. Sci. USA 98: 13681-13686. Bannerman, D. D., J. C. Tupper, W. A. Ricketts, C. F. Bennett, R. K. Winn, J. M. Harlan. 2001. A constitutive cytoprotective pathway protects endothelial cells from lipopolysaccharide-induced apoptosis. J. Biol. Chem. 276: 14924-14932. Krikos, A., C. D. Laherty, V. M. Dixit. 1992. Transcriptional activation of the tumor necrosis factor α-inducible zinc finger protein, A20, is mediated by κB elements. J. Biol. Chem. 267: 17971-17976. Denecker, G., W. Declercq, C. A. Geuijen, A. Boland, R. Benabdillah, M. van Gurp, M. P. Sory, P. Vandenabeele, G. R. Cornelis. 2001. Yersinia enterocolitica YopP-induced apoptosis of macrophages involves the apoptotic signaling cascade upstream of bid. J. Biol. Chem. 276: 19706-19714. Hoffmann, R., K. van Erp, K. Trulzsch, J. Heesemann. 2004. Transcriptional responses of murine macrophages to infection with Yersinia enterocolitica. Cell. Microbiol. 6: 377-390. Sauvonnet, N., B. Pradet-Balade, J. A. Garcia-Sanz, G. R. Cornelis. 2002. Regulation of mRNA expression in macrophages after Yersinia enterocolitica infection: role of different Yop effectors. J. Biol. Chem. 277: 25133-25142. Hossain, G. S., J. V. van Thienen, G. H. Werstuck, J. Zhou, S. K. Sood, J. G. Dickhout, A. B. de Koning, D. Tang, D. Wu, E. Falk, et al 2003. TDAG51 is induced by homocysteine, promotes detachment-mediated programmed cell death, and contributes to the development of atherosclerosis in hyperhomocysteinemia. J. Biol. Chem. 278: 30317-30327. Spengler, D., M. Villalba, A. Hoffmann, C. Pantaloni, S. Houssami, J. Bockaert, L. Journot. 1997. Regulation of apoptosis and cell cycle arrest by Zac1, a novel zinc finger protein expressed in the pituitary gland and the brain. EMBO J. 16: 2814-2825. Aravind, L., V. M. Dixit, E. V. Koonin. 2001. Apoptotic molecular machinery: vastly increased complexity in vertebrates revealed by genome comparisons. Science 291: 1279-1284. Zhang, X. M., H. Lin, C. Chen, B. D. Chen. 1999. Inhibition of ubiquitin-proteasome pathway activates a caspase-3-like protease and induces Bcl-2 cleavage in human M-07e leukaemic cells. Biochem. J. 340:(Pt. 1): 127-133.